The 2017 Toyota RAV4 is everything a great SUV should be: spacious, well-equipped, and capable enough to get to wherever you need to go. Drivers all over Avon, Indianapolis, and Plainfield love it, but will this SUV be perfect for you? To find out, the team at Andy Mohr Toyota is here with everything you need to know about the 2017 Toyota RAV4. Check out our review to learn more, and be sure to contact us when you’re ready to see it for yourself! As one of the most popular SUVs on the market, the 2017 RAV4 delivers a powerful performance. Its standard 2.5L 4-cylinder engine delivers 176 horsepower and 172 lb-ft of torque. Also, it comes with available Dynamic Torque-Control All-Wheel Drive for optimum control when traveling through rough or slippery streets. The SUV has a variety of features under the hood, as well, to boost performance even further. For those who want an even more exhilarating ride, then activate Sport Mode. With Sport Mode, the system will optimize acceleration and revise shift points. Paddle shifters and a sport-tuned suspension are also available. 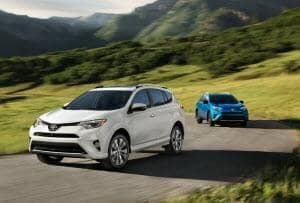 The RAV4 is efficient, too, with an EPA-estimated 26 combined MPG*. If you want even more exceptional fuel economy, check out the RAV4 Hybrid. With an innovative hybrid powertrain and advanced performance technologies, the Toyota RAV4 Hybrid provides an EPA-estimated 32 combined MPG*. 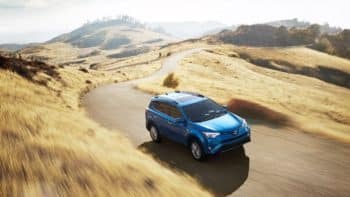 Review the 2018 Toyota Rav4 today! The Toyota RAV4 is equipped with tons of features for a better experience behind the wheel. One of the most advanced amenities inside the SUV is the Entune™ Premium Audio with Integrated Navigation and App Suite. With this infotainment system, you’ll have all the features you need to enjoy the road ahead. Plus, it gives you access to a variety of mobile apps for enhanced convenience and entertainment. Best of all, there’s more than enough room for everyone in the SUV. This SUV seats up to five passengers and has 42.6 inches and 37.2 inches of legroom for the front and back seats, respectively. It also has up to 73.4 cubic feet of maximum cargo room behind the first row of seats, so you’ll have no problem fitting all the luggage and bags you need for your next road trip. In addition to a great performance and a luxurious, well-equipped interior, the 2017 RAV4 offers incredible safety. It was named an Insurance Institute for Highway Safety 2017 TOP SAFETY PICK+, and it received a 5-Star Overall Safety Rating from the National Highway Traffic Safety Administration. With ample interior space, tons of features, and a capable yet efficient performance, the 2017 Toyota RAV4 can be a great SUV for any driver in Avon, Indianapolis, and Plainfield. However, the best way to tell if it is the best car for you is if you get behind the wheel and experience it for yourself. To do just that, schedule a test drive at Andy Mohr Toyota now!